Emeralds are the green variety of the mineral beryl, whose more-common blue counterparts are known as aquamarines. Emeralds are fascinating gemstones deriving its name from Greek word smargdos, which means green stone. While the first emerald mine is often said to have belonged to Cleopatra, emeralds in Egypt actually go back to the beginning of Ptolemaic period, about 300 BC. Emeralds were actively mined there until about 1500, when demand ebbed after Spanish conquistadors appropriated the high-grade beryl mines that were tended by native South Americans in what is now Columbia. Today, mines in Muzo and Chivor, Columbia, continue to be leading sources of pure-green emeralds, although the industrial methods used to extract the stones is thought to do needless damage to the emeralds themselves. 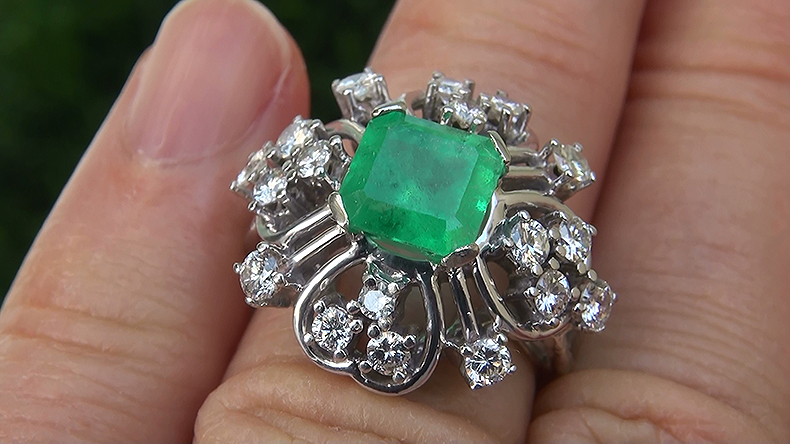 Emerald, May’s birthstone, has been prized for thousands of years for its lush green gemstone hues and rare beauty. Emeralds symbolize eternal hope, rebirth and the arrival of spring and some cultures believed the gem rewards its owners with love, intelligence and eloquence as well. From an elegant emerald pendant and a dazzling pair of emerald earrings to an opulent emerald cocktail ring and a stunning emerald bracelet – an piece of emerald jewelry is nature’s greenery set in stone. 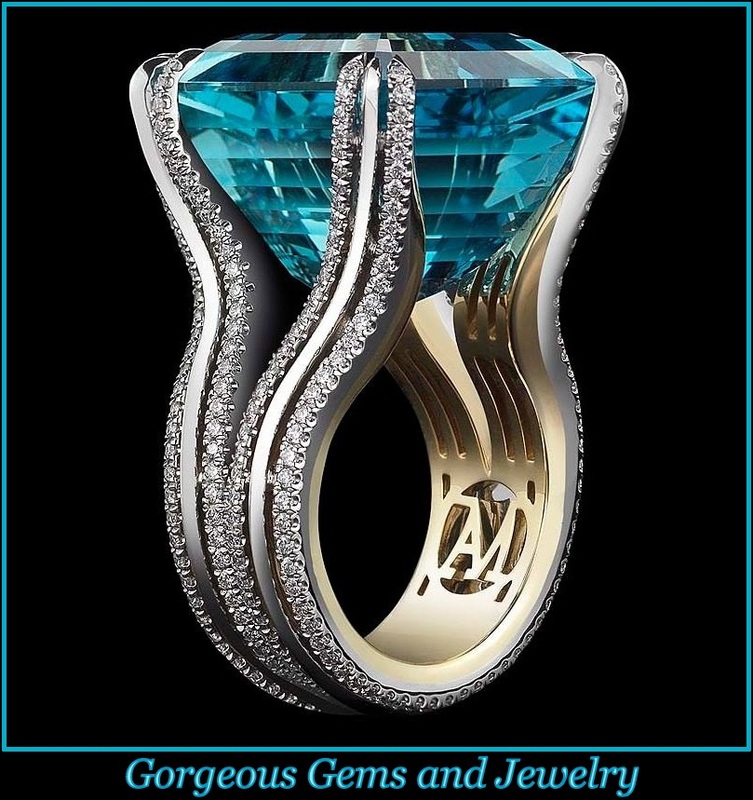 An exquisite certified 2.85 Carat Natural Colombian Emerald and Diamond Estate Ring. 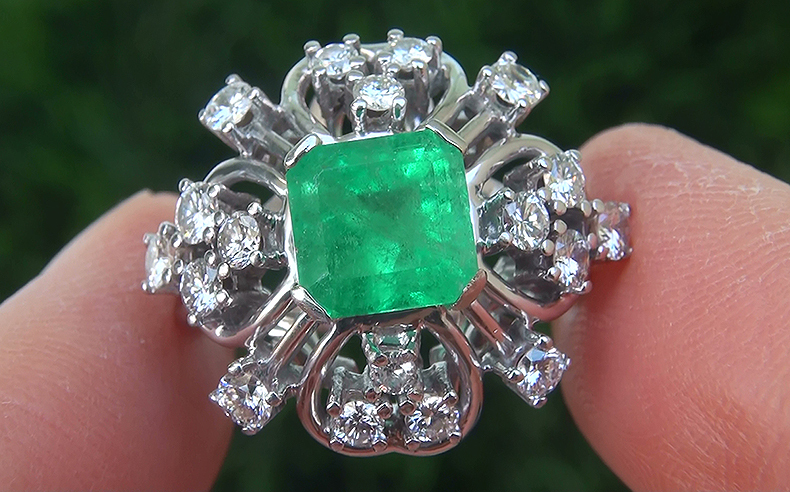 This exceptionally rare and unique ring boasts a big Colombian Emerald with a stunning natural vivid green color. 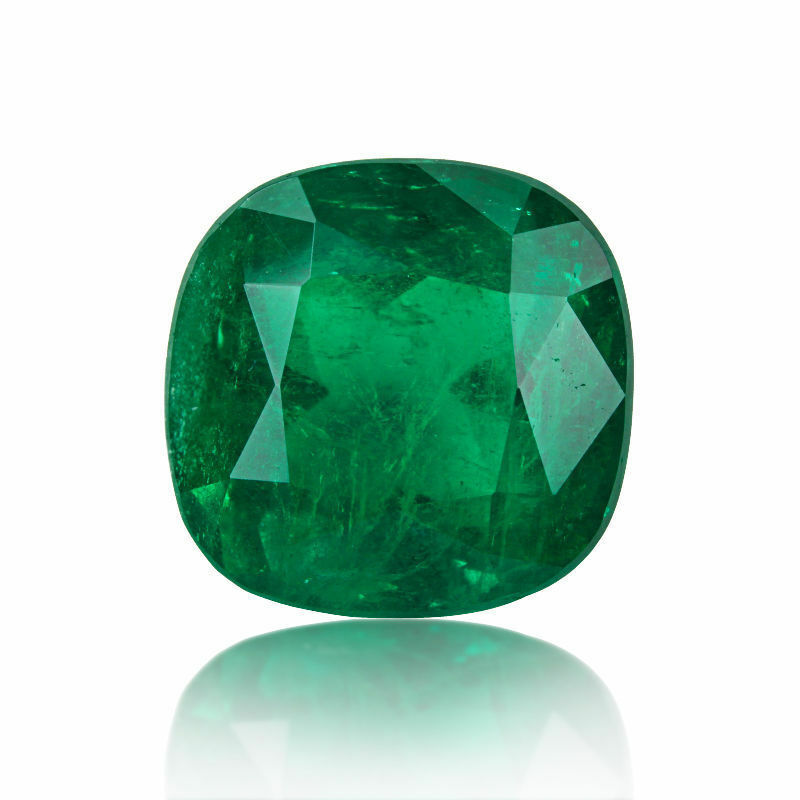 The natural emerald weighs in at an impressive 1.80 Carats and features SI clarity with moderate inclusions. This world class gemstone is set in a master crafted solid 18k white gold setting and features 1.05 carats of VS1-SI1 clarity near colorless G color round brilliant natural accent diamonds. The rich green glimmer of emerald makes it an ideal medium for pieces with a touch of fantasy. 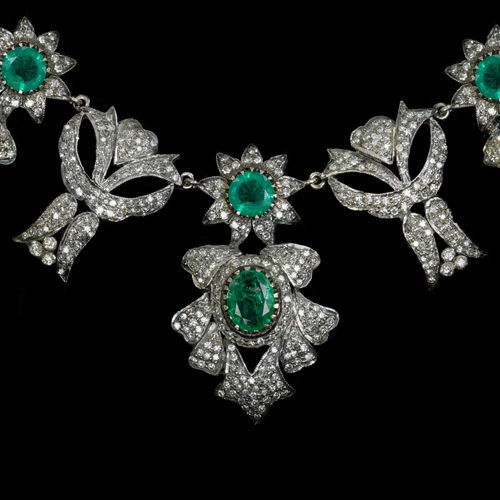 A magnificent vintage emerald and diamond necklace . This impressive piece with 12 carats of diamonds and over 15 carats of natural emeralds is a monumental example of craftsmanship and time intensive work. The piece has approximately 2000 diamonds set into this piece as the stones go all the way around the neck. It’s wonderful vintage design and sparkling diamonds holds an undeniable air of old world luxury and elegance. It is truly an outstanding work of wearable art and it must be seen in person to be fully appreciated! 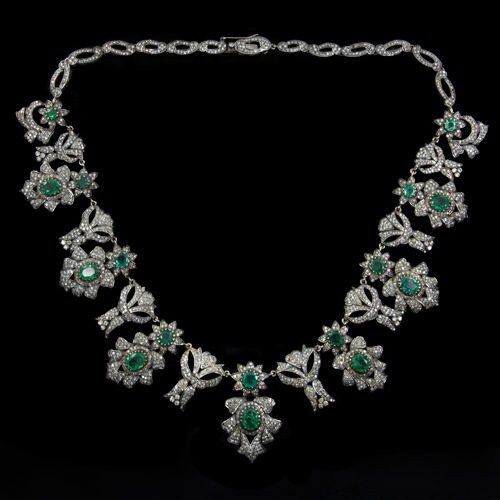 Sixteen generously sized natural emeralds are securely prong set throughout the front of this piece. They are oval and round in shape and they have a lovely green hue that is well saturated. The emeralds have a luscious color and above average clarity, especially considering they are emeralds going for a necklace. The diamonds are closely set allowing for amazing sparkle! The diamonds face-up white and they are clean to the naked eye showing no visible inclusions. This is a rare one of a kind treasure that is certainly a statement piece which will make you the envy of all of your friends! This glamorous piece is made from solid 14 karat yellow gold and topped with sterling silver. The necklace weighs a substantial 68 grams and it measures 18 inches in length. The metal work and old world design is truly fantastic with beautifully intricate details. Gorgeous Estate 23.81 Ct Colombian Emerald and Diamond Necklace. 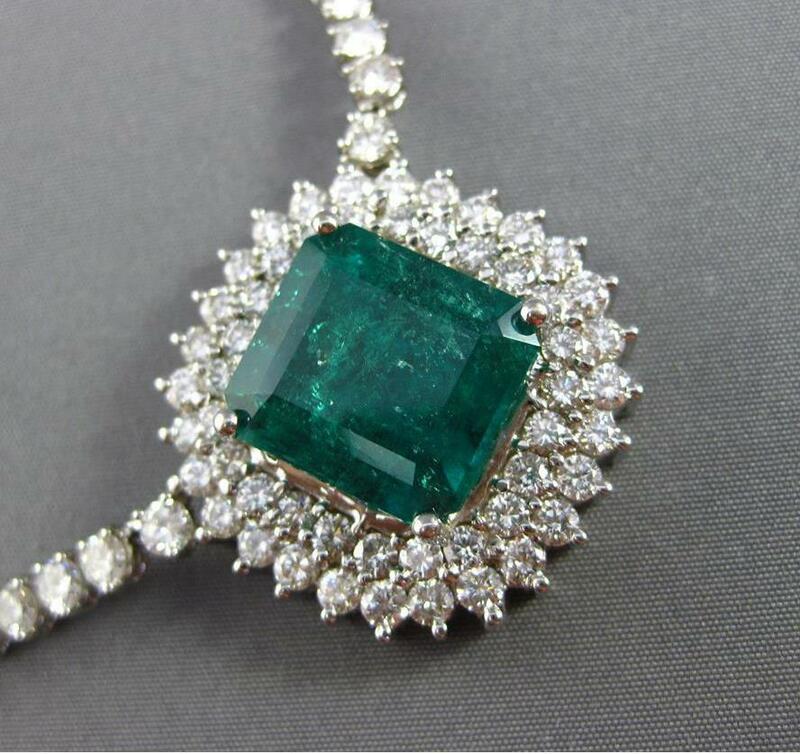 12.81 Ct Colombian Emerald. Exceptional color meets bold elegance in this gemstone necklace featuring vivid Zambian emeralds and diamonds bezel set in rich 18k yellow gold. 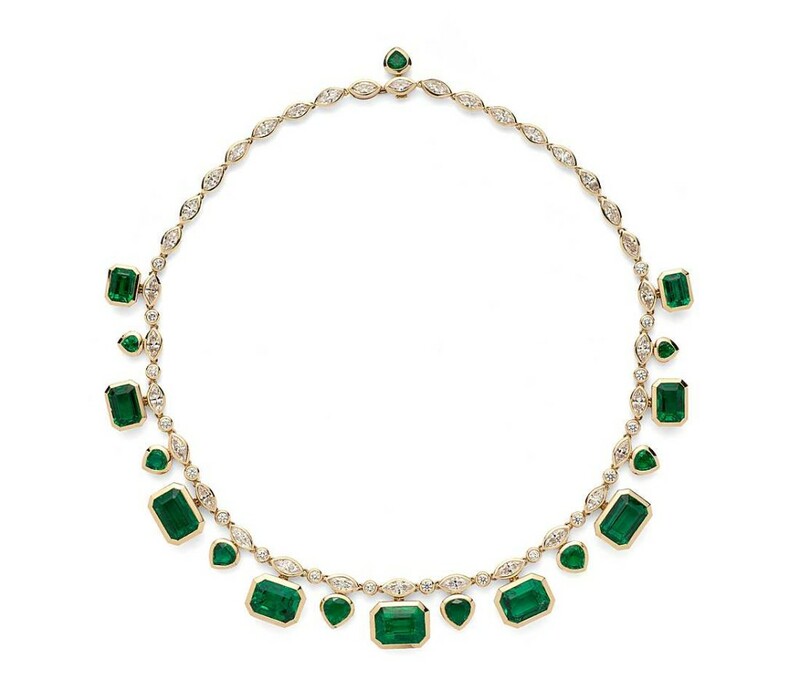 This necklace is part of a contemporary set designed by Marina Bulgari, granddaughter of the famed Sotirio Bulgari, including matching drop earrings. 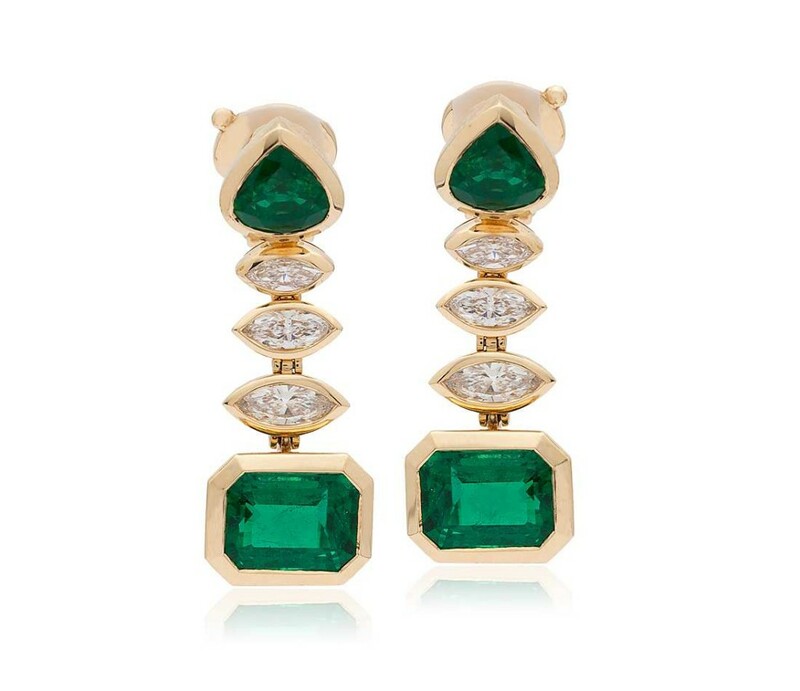 Exceptional color meets dramatic design in these exclusive drop earrings featuring vibrant Zambian emeralds, and marquise diamonds, bezel set in rich 18k yellow gold. These earrings are part of an extraordinary set – designed by Marina Bulgari, granddaughter of the famed Sotirio Bulgari. 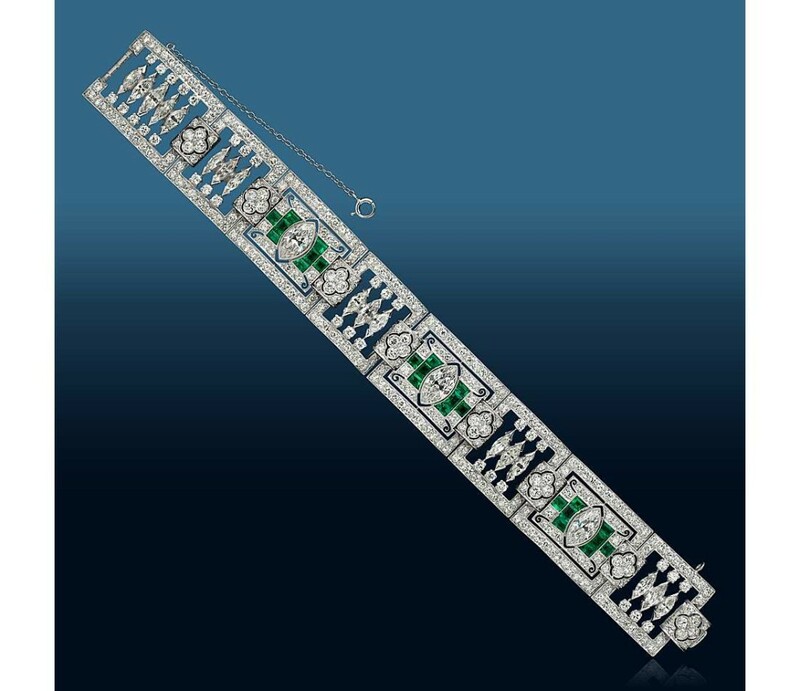 An exceptional Art Deco creation, this platinum link bracelet features vibrant green emerald gemstones in an exquisite pattern of brilliant marquise and round diamonds. 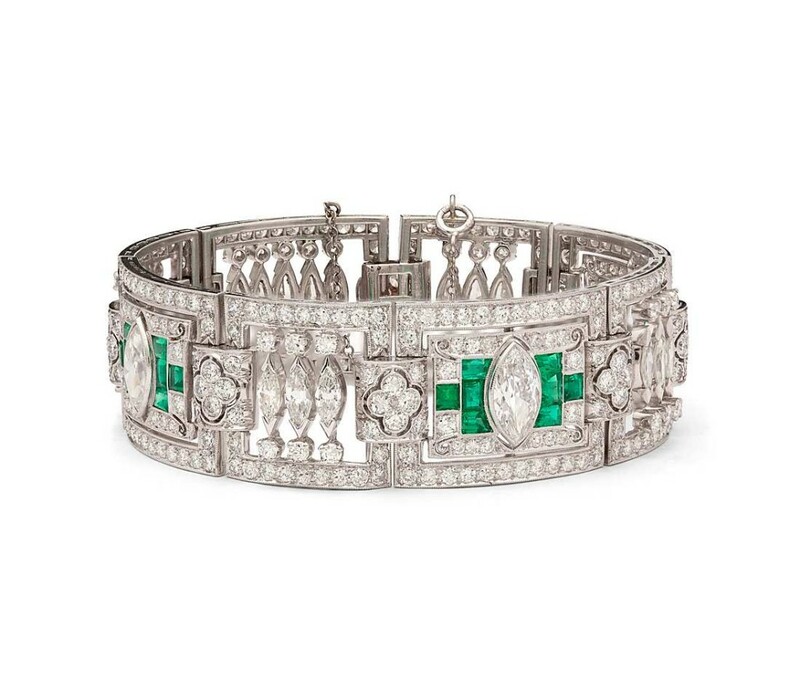 Purchased from the estate of a Midwest heiress, this bracelet is in very good condition with minimal wear. Clarity in emeralds speaks about what the gem looks like on the inside and this is what makes an emerald a different gem than any other. The pleasant green color of emerald is most beautiful, intense and radiant with fine nuances, which is an incomparable distinctive feature of the gemstone. Emerald is the most precious gemstone of the BERYL GROUP of minerals, which is often clouded by inclusions, which are not classified as faults but are evidence as to the genuineness of the precious gemstones as compared with synthetics and other imitations. The experts refer these inclusions as “jardins”, a french word meaning “garden”. These wonderful gardens are birthmarks of emerald. Most emeralds present inclusions that are small bits of other minerals, gas, liquid, and crystals that the emeralds take on in the crystallization process. About 99% of all natural emeralds will present inclusions. In general, the fewer the inclusions, the higher the value of the gem. Of course, clarity is an important factor in evaluating an emerald but it is not the most relevant. Inclusions in emeralds are very special. Expect to find them. Actually, any emerald without them is immediately suspected as synthetic or an imitation.